I first became aware of the concept of a “Mud Run” while watching the television show Workout on Bravo, but sadly found that there were none, as far as I could tell, anywhere near the tri-state area. However, one day I noticed one of those little advertisements on the sidebar in Facebook for something called the “Merrell Down and Dirty Mud Run”. I immediately registered and more little advertisements began popping up on Facebook and I began registering for those also. 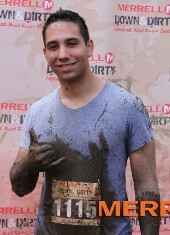 Now I’ve ran in the Spartan Race, Warrior Dash, Merrell Down and Dirty Mud Run, and Tough Mudder. With this year’s races are complete I’ve begun looking forward to 2011. As of this post I’ve registered for six events. Two Tough Mudder events, one in Pennsylvania (9 miles) and the other in Vermont (8 miles), two Spartan Races, one called a “Spartan Sprint” (3 miles) and the other the “Super Spartan” (8 miles), and two Warrior Dash events (3+ miles). I’ve added a new sidebar which will list all the upcoming events I will be attending, along with dates, links, length, and state. You actually can sign up. Just visit the site where you can register for one of the events listed and search for "Spartan Race" and they all come up to register. I guess they just haven't updated their website yet with the actual links.